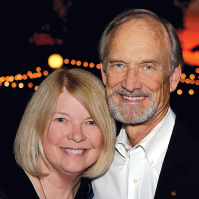 Christine & Russell are proud of their 90-year-old LONG FAMILY TRADITION in Tucson real estate. Christy's family originally homesteaded in the Tucson Mountains and many are still builders and developers. Russell's grandfather founded Long Realty and his father built the company to 8 offices. Together they make a terrific pair — Russell handles the logistics, shows properties, works the closings; Christy takes care of the publicity, public relations and advertising — working with the photographer and the graphic designer to ensure the image of their partnership. Although Russell has the Long name, he is better known for his hard work, honesty, prompt response to phone calls and e-mails, wise negotiation, and extensive real estate experience. Russell's 41 years of real estate experience combined with Christy's art background, plus a full team of professionals — including office manager Dana Raney, marketing specialist Linda Leighton and graphic designer Bettina Mills — has helped them break a record in Tucson Real Estate in 2002, 2004 and again in 2006... and to become Tucson's #1 Agent for three years.